Nissan's self-driving strategy includes offering its ProPilot system, right, on mass-market vehicles such as the Serena family van, right. Lexus, in contrast, is offering its CoDrive package on the low-volume luxury 2018 LS, below. ABASHIRI, Japan — The redesigned 2018 Lexus LS can drive down the highway automatically steering itself around almost any curve as it stays centered in the lane — all while the driver sits back ensconced in its palatial luxury with little more than a fingertip on the wheel. It sounds like an impressive milestone for Toyota Motor Corp.'s luxury brand — until you recall that Toyota's Japanese rival Nissan Motor Co. rolled out a similar technology a year ago called ProPilot. Nissan's system is sold in Japan in the Serena family van and X-Trail crossover, two nameplates decidedly more pedestrian than Lexus' pricey flagship sedan. To be sure, the new Lexus has plenty of other self-driving and advanced safety features, including an automated lane-change assist, that outgun much of the technology in the downmarket Nissans. "Typically, most people think Toyota is behind," said Takaki Nakanishi, an independent auto analyst in Tokyo. "But it's just that their approaches are different." Aggressive Nissan is pursuing a mass- market strategy to deploy basic automated systems in volume vehicles, while waving the "autonomous driving" banner to cultivate the wow factor. Circumspect Toyota, by contrast, is introducing the technology at the top of its product range and trickling it down to its mass-volume models as costs come down. Toyota demurs from touting its technology as "self-driving." It prefers to pitch the safety benefits rather than convenience. "We need to be cautious with the term 'automated driving' to avoid misunderstanding and overconfidence, such as the ​ idea drivers do not need to do anything in automated vehicles," said Ken Koibuchi, Toyota's executive general manager in charge of autonomous driving. Still, Lexus touts the new LS, which arrives this fall, as the "safest car in the world." Each strategy carries risks and rewards. Early mover Nissan may score brand recognition and quick sales, but it could also be stung if the nascent technologies prove troublesome. On the other hand, Toyota may find it harder to persuade people to pay extra for the tech if it is marketed under a safety message. 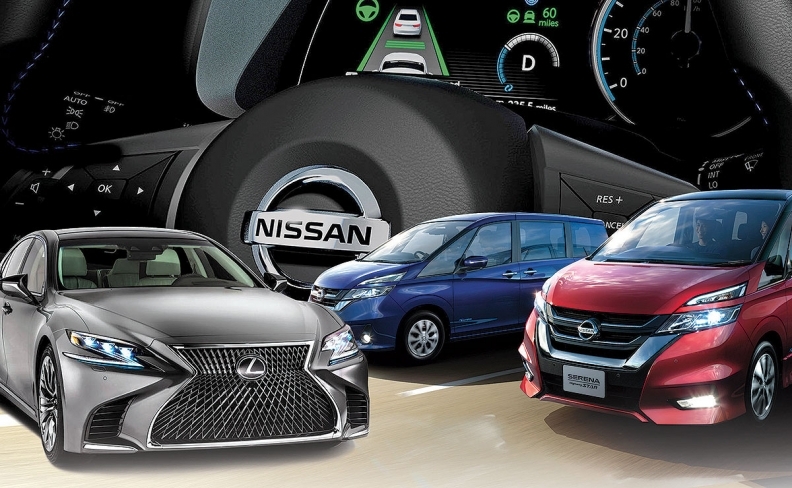 Nissan will try to cut costs off the bat by spreading the systems across volume models. But it could be saddled with wasted investments if the technology doesn't catch on. Meanwhile, Toyota is deploying it in luxury cars to better absorb cost — but low volumes may keep costs high. The fifth-generation LS offers a peek at Toyota's plan. Automotive News got a first drive of the LS at a Japanese media event in northern Japan. Its automated driving and advanced safety gear will be the basis of new technology migrating to mainstream Toyota brand vehicles starting next year, executives said. 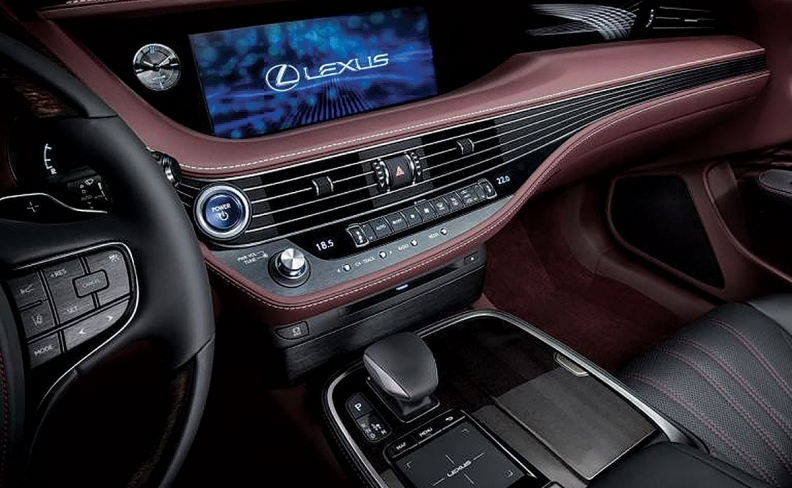 In the LS, the suite of new technologies is dubbed Lexus Safety System +A. It covers a range of advanced safety features, including two that Lexus claims are world firsts. One is a pre-crash emergency braking system that detects pedestrians and then self-steers the car around the person when the car can't stop in time. The other is a rear cross alert auto-braking system that can recognize pedestrians and stop the car when it is moving in reverse, such as when pulling out of a parking spot. The LS also gets a package of automated driving technologies called Lexus CoDrive. CoDrive encompasses a lane-tracing assist that automatically steers the car through highway bends. Among the subtle advances over Nissan's ProPilot is a function that automatically slows the car when approaching a curve so that the LS can keep automatically tracking the lane. Nissan's version doesn't automatically slow the car in that scenario. CoDrive also gets a lane change assist, a technology that monitors surrounding traffic and then changes lanes, adjusting speed as necessary to merge with traffic. The driver just depresses the turn indicator, and the car does the rest when it is safe to go. The next-generation safety packages will start arriving in 2018 in Lexus and Toyota models. Toyota's Koibuchi said the system in the LS and ones arriving next year offer Level 2 autonomy because they still require the driver to be ready to intervene, even while being hands off. Toyota's slow and steady approach is part of a long-term road map. Toyota expects to reach autonomous highway driving — meaning a fully automated drive from on-ramp to off-ramp — in around 2020, and reach Level 4 autonomous driving on city surface streets in the early 2020s. But Nissan plans to be a step ahead. Nissan expects to build on ProPilot with a more advanced system due around 2018 that will allow automated driving across multiple lanes. And it targets a system that will enable "intersection autonomy" by around 2020. That will allow cars to navigate city intersections and urban traffic without driver intervention, Nissan promises. Koibuchi said the devil is in the details. For example, does intersection autonomy mean the car can stop automatically at red lights? Does it mean the vehicle can automatically make right and left turns? "There is a huge range of capabilities when you talk about city driving," he said. "I don't think Toyota's technology is behind Nissan's." Yet Nissan is charging ahead as early as September with the debut of its next-generation Leaf electric vehicle, a showcase for its updated ProPilot system. The Leaf will get the current generation auto-steering lane-tracking function, plus a new push-button auto-parking function. Nissan says the technology will allow the Leaf to self-park in parallel, angled, front-in and straight back-in spots by automatically taking over the accelerator, braking and steering. Not even the Lexus LS, with its 28-way power front seats that feature heating, cooling and massage, can boast that amenity. Michihito Shimada, Lexus' general manager for parking assist systems, said his company is working on similar technologies but has different priorities — hence, Lexus' initial focus on parking systems that prevent pedal misapplication and watch for hidden pedestrians. "The basis should first be parking safety," he said. "The next in the sequence is convenience."